Busch & Chen's trusted services are based on the grounds of the knowledge and experience. In our concept, the industry expertise of our partners is merged with professional transaction strength. 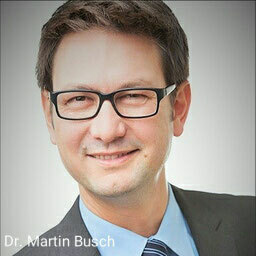 Martin is founding and managing partner of the company and based in Düsseldorf. His profound experience in industry and technology includes machinery, chemical engineering, automation, semiconductor and other high-tech industries, new energy, measurement technology and equipment suppliers. Prior to his commitment in industry-specific cross border transactions, Martin was engaged in new business development for German technology leaders and industrial general contractors with a strong focus towards East Asian markets. Martin holds a PhD degree in engineering from University of Duisburg-Essen after graduating in business management, engineering and East Asian studies from Dresden University of Technology. His interest in the harmonization of business cultures is supported by extended professional stays in Shanghai, Moscow and Michigan. He is fluent in German, English, Italian and Russian language and conversational in Mandarin. Michael is founding and managing partner of the company and head of the China operations. Based in Shanghai, he is most familiar with local business processes, including decision paths and contractual agreements. His excellent long-grown professional network is deeply rooted in industry. It has been repeatedly valuable in the preparation of industry-specific cross border transactions. Michael has gained extensive business experience in the China domestic market and substantial industry-specific knowledge in high-tech, semiconductor, manufacturing, engineering and equipment industry. After engagements with Samsung Electronics and STMicroelectronics, he joined Infineon Technologies as Sales and Marketing Head of the contract manufacturing China division, including a two-years-assignment to the Infineon headquarters in Munich, Germany. Since 2009, Michael has been CEO of Lybiztech Shanghai Limited, dedicated to the distribution of large-scale plant machinery, equipment and industrial goods to China customers. Michael graduated from Harbin Institute of Technology (C9 league) in Energy Resources and Dynamics. He is a fluent speaker in English and Chinese language. Besides he is a great fan of basketball and jazz music. Our core business value is the initiation and support of industry-specific cross border transactions. For extended operations, including due diligence services, we rely on the support by well established M&A partner companies in Germany and China with proved experience and excellent record track. Our cooperation partners are carefully selected according to the specific project requirements and are highly dedicated to ensure successful and sustainable transaction results. If you wish to learn more about our cooperations in a specific project or if you need a trustful recommendation in a certain topic, please do not hesitate to contact us.